Exchange-traded funds (ETFs) have fast gained popularity for their reputation as a low-cost investment option. Cost-conscious investors have been attracted to these tracker funds because of their ability to track global stock markets for an annual fee as low as 0.04%. Investors should be sure to check the total costs when they choose a tracker fund as not all of them are as cheap as you might think. As ETFs have become more popular they have expanded the regions, assets and indices to which they offer exposure. But niche investment themes and remote stock markets are not so easy to trade at a low cost, and the fees on some of these trackers are starting to look more like those charged by active funds. Analysis by AJ Bell shows that some ETFs have fees of up to 1%. Indeed, at least 26 trackers charge 0.8% or more. The most expensive tracker in our analysis is the Expat Bulgaria Sofix ETF (BGX), which has a hefty fee of 1% and tracks the performance of the Sofix index. Investors may not be surprised that this is a concentrated market and the ETF only follows the 15 most liquid companies on the Bulgarian stock exchange. A high exposure to a low number of stocks means performance is likely to be volatile. Pharmaceutical firm Sopharma, for example, accounts for 14.9% of the index while holding company Chimimport accounts for 12.3% of assets. 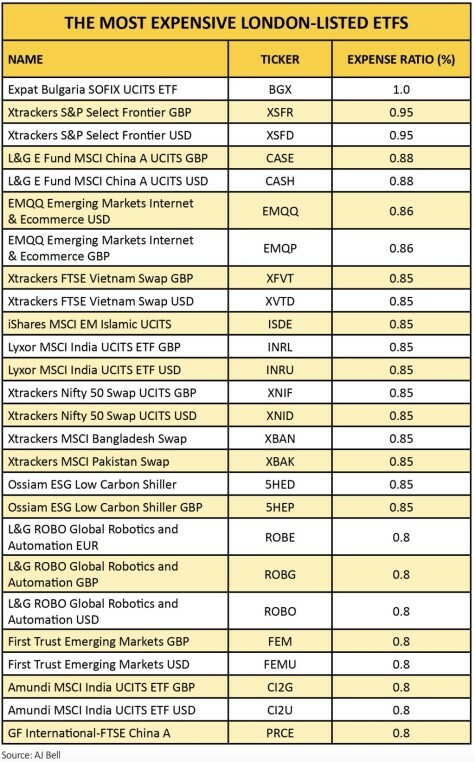 Far-flung regions make up a considerable proportion of the most expensive ETFs, including those which track stock markets in Bangladesh, Pakistan and Vietnam. Xtrackers has ETFs tracking these markets, each of which has a charge of 0.85% – similar to what you might expect to pay for a fund run by an active manager. Also among the priciest products are those which take a thematic approach to investing. The Ossiam ESG Low Carbon Shiller ETF (5HEP) tracks companies with a reduced carbon footprint and good economic, social and governance (ESG) profile, screening out businesses involved in activities such as tobacco, coal and weapons. It has a fee of 0.85%. 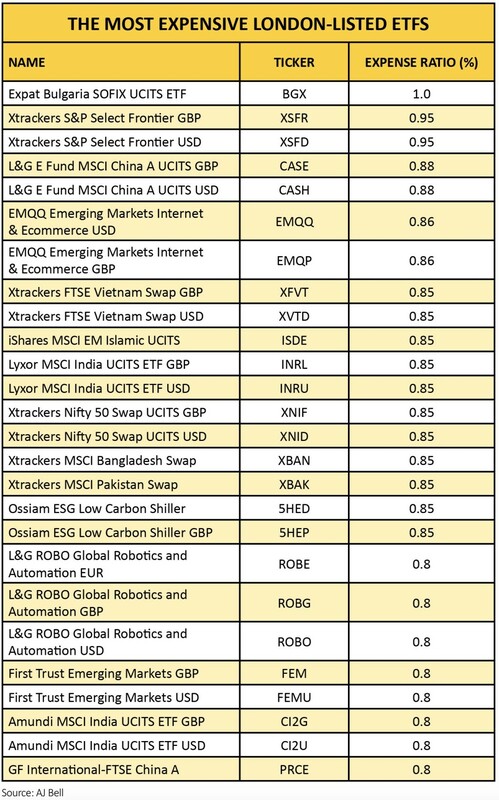 Meanwhile, the L&G Robo Global Robotics and Automation ETF (ROBG) tracks global companies focused on the robotics and automation industries. Around half of its assets are in US equities and a further quarter in Japanese companies, with holdings including sensor manufacturer Keyence and Israeli medical device company Mazor Robotics. It charges 0.8%. One major factor which determines the price of ETFs is investor interest. As funds build up their assets under management they are able to pass on the economies of scale and start to reduce their fees. This is particularly evident among some of the cheapest ETFs, which are usually simpler offerings tracking a well-known stock market index such as the FTSE 100 or S&P 500. After all, the difference in cost to a provider of running £500m or £1bn of investors’ money is minimal. Stronger demand for these products also means there is more competition in the market, which encourages providers to keep their costs as low as possible. The Expat Bulgaria Sofix ETF, for example, has assets under management of around £12m, whereas the Invesco S&P 500 ETF, which has charges of just 0.05%, has assets of around £2.8bn. Just because an ETF charges more than you had anticipated, it doesn’t mean you should immediately write it off. Firstly, it is worth delving into the potential returns – one ETF might charge 0.05% but only deliver a return of 1%, while one charging 1% could grow your money by 10%. 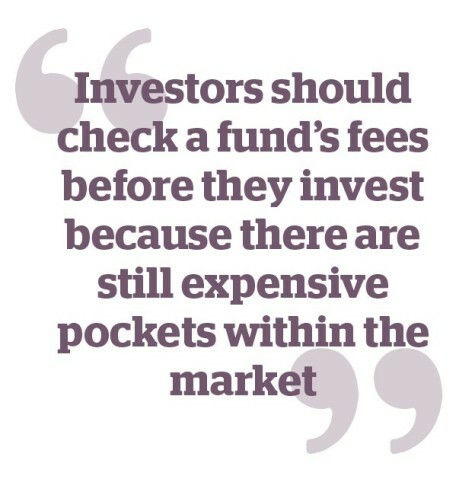 If a fund is consistently justifying its fee then, just as with a skilled active manager who charges more than his or her rivals, it may be worth paying up. But factoring in the risk you are taking on for these potential returns is crucial. Investors should also compare the costs of an active fund with a similar mandate; if there is little difference in the cost, some investors may prefer to pay a little extra to employ an active manager instead. It’s worth remembering that tracker funds don’t aim to outperform, only to mirror the index they are following, whereas a fund manager will aim to beat the market.